I’m a Previvor. Previvors are individuals who have a predisposition to cancer but who do not have the disease. 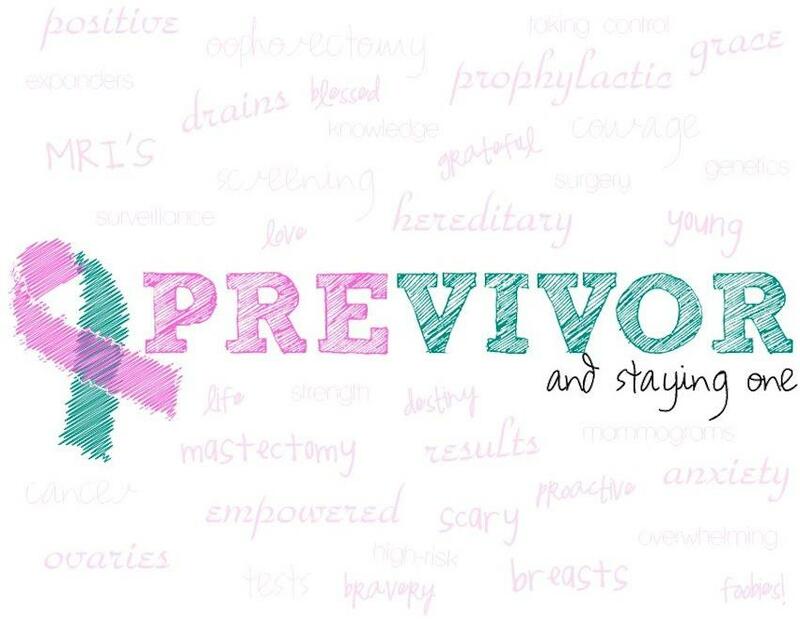 I’m a previvor because I have a genetic mutation (RAD 50) that puts me at a very high risk for breast and ovarian cancer. Additionally, I have a strong family history of breast cancer. So I am preparing to have surgery to reduce my risk. On November 20, 2015 I will have a prophylactic (preventive) double mastectomy (with immediate reconstruction called DIEP FLAP, if you like to know that kind of stuff). It’s a long surgery, a hospital stay of 3-4 days, and a long, 6-8 week recovery. After I learned of my high risk in January 2015, I started doing a lot of research. I’ve read books, visited seven doctors, joined several groups on Facebook and joined a local (Cincinnati) support group. I’ve learned acronyms and terms I wish I never had to learn, like HBOC, DIEP, FLAP, etc. I’ve seen plenty of before and after photos (!). I’m going into surgery feeling as prepared as I can possibly be. But I still covet your prayers for my surgery and my recovery, the surgeons and medical staff, my family and friends, who have been wonderfully supportive. I am now 5 weeks post-op and recovering well, but slowly, and I tire easily. The doctors are all pleased with my progress. The recuperation time is usually 6-8 weeks. I hope to begin working 1-2 hours a day in January 2016. I find it difficult to sit at a computer for more than 30-60 minutes, so I will not be resuming a full time work schedule for several more weeks. I consider myself fully recovered. I’m 10 months post-surgery, back to work, traveling, doing water aerobics and last week I hiked a huge mountain in North Carolina to see the sunrise! I visit a support group for women at high risk of breast or ovarian cancer so I can telll my story, encourage them and hopefully lessen their fears. I also volunteer with an organization called FORCE to offer information over the phone to women at high risk.